It's the Heat AND Humidity! Home › BLOG › It's the Heat AND Humidity! We knew the Baltimore summer would arrive in full force at some point. We’ve been lucky so far with a never-ending cycle of April showers and temperatures. And it was fun while it lasted. But now we must turn our attention to dealing with an actual Eastern summer scorcher. Even if you’re a seasoned heat-and-humidity veteran, it’s always good to take a refresher course. First of all, let's discuss why heat and humidity affect runners so much. When we run, our body temperatures are raised. We must cool ourselves to keep from overheating. We do this by diverting blood from our running muscles to our skin, which causes our sweat glands to perspire. As our perspiration evaporates, heat is taken away, and we cool off. It's a pretty cool way (no pun intended) to keep us running efficiently. The hotter it is, the more blood is diverted to the skin to keep our engines from overheating. If there is more blood going to the skin, however, there is less going to the muscles we use to run. As a result, we have to run harder to run same speed. What does all of this mean in hard numbers? Temperatures between 60 and 75 degrees will cause our heart rates to climb approximately 2 to 4 beats per minute. When the temperatures reach 75 to 90 degrees, we’re looking at a 10-beat-per-minute increase. That is significant. And what role does humidity play in this whole thing? Well, we've all heard the saying, "It's not the heat; it’s the humidity." Actually, it’s the heat AND the humidity. 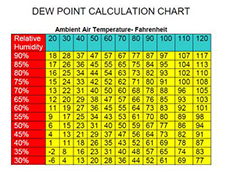 Humidity is the percent of water vapor in the air (as related to the amount that could be in the air). The higher the humidity, the harder it is for perspiration to evaporate. When our sweat doesn't evaporate, we can’t cool off. So our bodies send more blood to our skin, which takes even more blood from our working muscles. If we are constantly sweating, we are losing water and electrolytes. The less water we have in our systems, the thicker our blood will be. And the thicker our blood is, the less effectively it cools, transports nutrients, and clears cellular waste. But that doesn’t mean we should hang up our running shoes. Our bodies are amazingly adaptable and resilient. We can continue to train during the dog days of summer. We just need to make some accommodations to do so at an optimal level. As we said, the heat alone causes our heart rates to increase. Add the humidity, and we’re likely to be in completely different Heart Rate Zones at our usual training and racing paces than we are during cooler weather. Summer is a great time to practice running by feel. I often recommend running by time (using minutes to determine the length of your run rather than distance) and by feel, especially on our easy/recovery runs. Your body doesn't know how far or how fast you ran a particular run. It simply knows that you ran at this effort level for this amount of time. Go exploring and try new running routes (hopefully shaded). Just run your typical effort level for the amount of time your goal mileage run would've taken. If you do have to race, then use the follow graph from Runner's World as a guide on what to expect. Hydrate, Hydrate, Hydrate. Hydration is not a mid-run practice only. Hydration is an all-day event. Water is not the only thing we lose while sweating. We need to replace the electrolytes and salts we lose. While running, I recommend adding a bottle or two to your water belt. (If you don’t have a water belt, invest in one.) Make one of those bottles a concentrated electrolyte mixture to take swigs of along with water. Since it's easier to find a drinking fountain than an electrolyte fountain, carrying your electrolytes with you is a good idea. Look for the times of day that have the best dew point. Reschedule that 5PM post-work run for a 5AM pre-work run. Hitting the roads before the sun comes up is one of the best ways to survive the heat. This also means you may need to break out your headlamps and reflective material from storage. Cotton is rotten and should be forgotten, especially in boiling hot weather. Light-colored, synthetic fabrics will help your body breathe and wick moisture from your skin to aid in the cooling process. A hat or visor will help keep the sun from beating down mercilessly. Also, if you do have to get your run in during the sunny part of the day, waterproof sunscreen is the way to roll. If the weather is just too much to handle, don't throw in the towel: bring it to the gym. Treadmills, pools, spin classes—you can find plenty of ways to keep your fitness level up until Mother Nature welcomes you back outside with more comfortable weather. Hot weather is almost a summer rite of passage for those with big fall aspirations. Be smart about your training, and you will come through this heat wave a smarter, stronger athlete. Follow these few tips, and you can keep your training rolling right along. Special thanks to: Tim Cary, FLEET FEET St. Louis Assistant Training Manager, coach of the FLEET FEET-sponsored Runnababez Elite team, and manager of the FLEET FEET Racing Team.